The story behind this astoundingly fabulous new variety of Little Bluestem grass begins with one of our state’s greatest natural resources, University of Minnesota Department of Horticultural Science Professor, Dr. Mary Meyers, who, between her roles teaching at the University, developing and coordinating statewide educational programs in environmental and consumer horticulture, writing books, and serving as Interim Director of the Minnesota Landscape Arboretum, somehow still finds time to do what she loves most: messing around with native and ornamental grasses. The direct result of her diligence is ‘Blue Heaven,’ a stellar new variety of Little Bluestem correctly viewed by plant experts as the best perennial introduction in the history of the University of Minnesota. 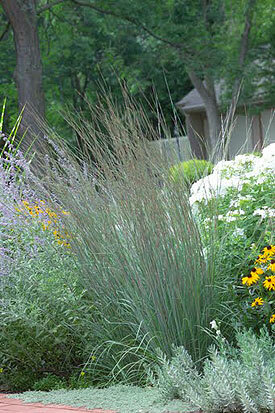 The main problem with the standard Little Bluestem is that it flops apart, hardy but lacking an upright, rigid gene or two. ‘Blue Heaven’ grows 40-48” tall and stays that way, exhibiting a much stouter, vertical habit, with better foliage color added for good measure. Blue-grey summer foliage starts hinting at burgundy red by late summer, then blazes burgundy with purple and violet highlights in the fall. White flower plumes appear in August. Full sun, Zone 3.